It's no secret that one of the largest expenses you will pay for when selling your house is your real estate agent. And it makes sense-- you want an expert selling your home. For those looking into agent-free alternatives, however, you may have come across a Flat-Fee MLS Service. While it may look like the key to selling your house on a budget, what are you actually getting from the deal? 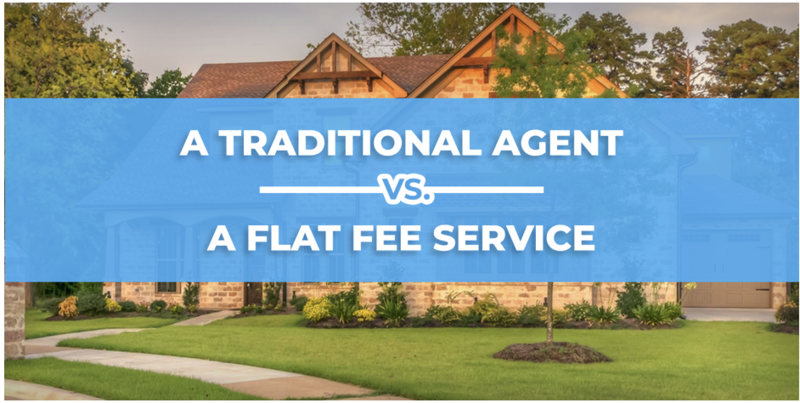 In this article, we'll go over what a flat-fee MLS service is, the services included, and the amount you can expect to save by using one. A flat-fee MLS service is a real estate brokerage that only completes some of the services a real estate agent does. The most prominent service they provide is listing your home on the MLS. The Multiple Listing Service (MLS) is available only to licensed real estate brokerages. It's their database of homes for sale in a specific region, and they use it to help their clients find their homes. So, if you're selling your home on your own (FSBO) but still want real estate agents to see your house, you'll either have to hire an agent or use a listing service. What services are included as part of flat fee service? Just as the perks of working with a real estate agent vary from brokerage to brokerage, the services vary with a flat-fee MLS service. Every MLS service includes one base service. That service is listing your home on the MLS. There's not much to listing your home on the MLS-- they'll give a description of your home and enter in the number of bedrooms and bathrooms, as well as a few other details. There is one thing to watch out for with this base service, though, and that's the description. Some MLS services serve many regions and operate on a mass scale. Many times, these services will write an error-riddled description that is not super exciting to read. Some listing services will give you a round or two of edits, and those are the services to go with. As the owner of the house, you know the best features to present and accent in the description. Your input in this phase is a crucial aspect of getting your house sold. You'll also want to make sure that the listing service lists your home in the correct MLS. The MLS differs from region to region and having your home listed outside of your MLS region could prove fatal to your home sale. This is most often an issue for larger listing services that work with many different regions. Listing your home on the MLS isn't all that listing services always do. Some services also provide photography, signs, social media promotion, and simple contracts, among other things. These services are all great-- if you know how to use them to your advantage. A real estate agent isn't worth their price simply because they have access to the MLS and print up fliers. People value top-rated, local real estate agents for their knowledge of the market in your area. Knowledge of your local market is crucial in pricing your home just right so that it sells for the best price fast. That knowledge of the market also gives your agent -- and by association, gives you -- access to other agents whose clients may be searching for homes like yours. These are services that listing services cannot provide. How much can you expect to save by using a flat-fee listing service? Let's talk about money. How much cash can you expect to save by using a flat-fee listing service? Some listing services don't charge you anything. That's right--it is free. The catch, though, is that they charge your buyer a percentage of the sale. This puts a bad taste in many buyer's mouths. The last thing they want when they are making one of the biggest purchases of their life is an unexpected cost. Depending on the buyer, this may cost you the sale. Other flat fee listing services charge between a few hundred to a few thousand dollars, depending on the services you use. The more exposure your house gets, the more you pay. It's also important to take into consideration the amount of time using a flat-fee listing service will cost you. Without the help of a local expert, your sale could extend months, and even years. Several flat fee MLS listing services have six and twelve-month plans. They wouldn't have those options available if their clients didn't need those options. If you are an expert in your local real estate market and have a track record of selling houses at a rapid rate for a profit, using a flat fee listing service will only cost you a few hundred dollars. If you're not a local real estate market expert with experience, the cost of using a flat fee listing service could be thousands of dollars. Whatever you choose, do your research. Using a flat fee listing service may sound like a rosy way to save a few bucks. If you want your best chance of accelerating the closing time and netting you more at the close, though, use a top-rated local real estate agent.